OnePlus’ OxygenOS unites the simplicity of stock Android and the customizability of a heavily skinned UI. While most of the elements on the Homescreen have been mostly left untouched, OnePlus Launcher – the default launcher for OnePlus smartphones – brings quick shortcuts via Shelf. You can open Shelf on OnePlus Launcher by swiping right on the Homescreen and it lets you access your favorite contacts, recent and most-used apps, and other useful information organized in the form of cards. The latest update to the launcher adds another handy shortcut and this one helps you remember where you parked your car. To memorize your parking spot on your behalf, Shelf needs access to your GPS location. Since the feature depends on your OnePlus smartphone’s GPS location, it is currently limited to parking spots outdoors or at places where GPS is still accessible. In the cases of indoor or underground parking, however, you can take an image of the parking area to memorize your vehicle’s location. The feature was rolled out with the ver. 3.3.2 of the OnePlus Launcher. Based on the information shared by users on OnePlus’ forums, it appears to be limited to devices running on Android 9 Pie. These include the OnePlus 6/6T as well as the older OnePlus 5/5T. However, we encourage you to go ahead and try the update on older devices like the OnePlus 3/3T. We’ll be glad to learn that the feature is supported on Android 8.1 Oreo, as well. Google Maps also offers a similar feature, allowing you to save your parking spots – besides helping you locate available parking spaces. This can be done by tapping on the blue dot on Maps that denotes your current location and then on “Save your parking”. While the Parking location feature in Shelf is also likely to be using a Google Maps API, the ease of access is what makes it more appealing. 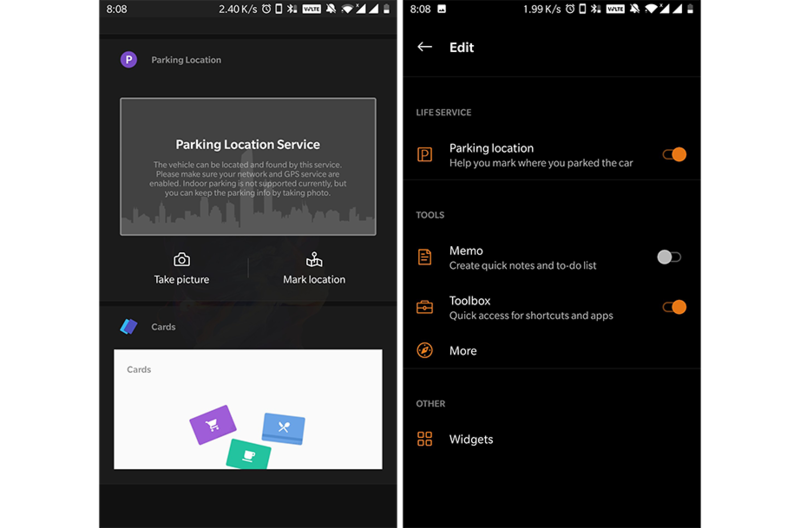 Apart from the functionality to assist you with remembering your parking spot, the launcher app also gets certain UI improvements as well as an improved algorithm for searching apps. To get the feature, update the OnePlus Launcher from the Google Play Store or grab the latest version from APKMirror. Please note, even though OnePlus Launcher is available in the Play Store, it can only be installed on devices running OxygenOS.